The vote for Brexit was a great shock; the morning after the vote, the disintegration of the European Union seemed practically inevitable. Britain, I believe, had the best of all possible deals with the European Union, being a member of the common market without belonging to the euro and having secured a number of other opt-outs from EU rules. And yet that was not enough to stop the United Kingdom’s electorate from voting to leave. David Cameron, along with the Treasury, the Bank of England, the International Monetary Fund and others have been attacked for exaggerating the economic risks of leaving the EU. This criticism has been widely accepted by the British media and many financial analysts. LONDON – The asylum policy that emerged from the European Union’s negotiations last month with Turkey became effective on April 4, when 202 asylum-seekers were deported from Greece. The policy has four fundamental flaws. It was negotiated with Turkey and imposed on the EU by German Chancellor Angela Merkel. The asylum policy that emerged from last month’s EU-Turkey negotiations—and that has already resulted in the deportation of hundreds of asylum seekers from Greece to Turkey—has four fundamental flaws. First, the policy is not truly European; it was negotiated with Turkey and imposed on the EU by German Chancellor Angela Merkel. Important progress was made at the donors’ conference for Syrian refugees convened in London on February 4. But much more remains to be done. The international community is still vastly underestimating what is needed to support refugees, both inside and outside the borders of the European Union. The leaders of the US and the EU are making a grievous error in thinking that president Vladimir Putin’s Russia is a potential ally in the fight against Islamic State. The evidence contradicts them. Putin’s aim is to foster the EU’s disintegration, and the best way to do so is to flood Europe with Syrian refugees. Gregor Peter Schmitz: When Time put German Chancellor Angela Merkel on its cover, it called her the “Chancellor of the Free World.” Do you think that is justified? 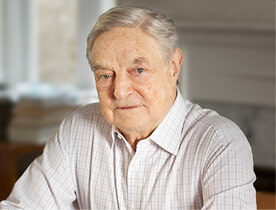 George Soros: Yes. As you know, I have been critical of the chancellor in the past and I remain very critical of her austerity policy. But after Russian President Vladimir Putin attacked Ukraine, she became the leader of the European Union and therefore, indirectly, of the Free World. The Terrorists and Demagogues Want us to be Scared. We Mustn’t Give In. Open societies are always endangered. This is especially true of America and Europe today, as a result of the terrorist attacks in Paris and elsewhere, and the way that America and Europe, particularly France, have reacted to them. As Britain approaches a crucial vote on whether to leave or remain in the EU, there is no doubt about how far-reaching the consequences could be for future generations. While some may be reluctant to be drawn into the debate, I believe the stakes are simply too high to remain silent.